Sorry, all! The sock giveaway winners have been notified! Thanks for playing! Another giveaway! 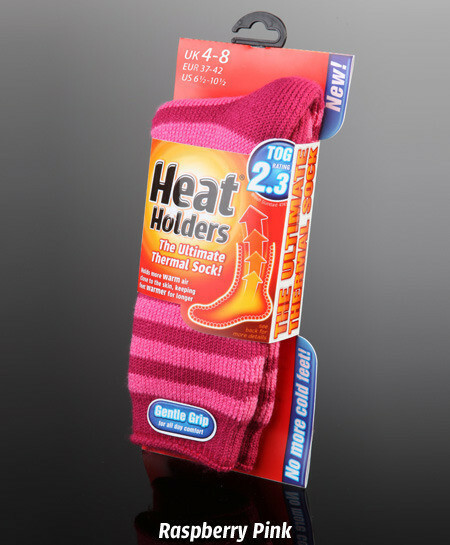 The makers of Heat Holders socks have graciously offered FOUR pairs of socks for a giveaway. Their socks are just the thing to go under your work or muck boots -- or any winter boot. Three things set these socks apart. An advanced is used to construct a sock. A unique long loop thermal pile enhances the warmth too. Finally, the interior of the sock is intensely brushed . This traps warm air generated by your body closer to your skin for longer, keeping you warm and comfortable. You can see a video on these socks that explains their special properties. To enter, just leave a suggestion for a new Heat Holder product and your contact info. So... My suggestion for a heat holder item is a pink poncho or shawl. What's yours? An ear muff would be great! I think heat holder gloves would be wonderful. In pink, of course :) I have a dozen pairs of gloves, at least, but none of them truly keep my hands warm. Sleeves with thumb loops. I think that would be awesome! Oh man. That product looks amazing! Nothing on me is ever as cold as my feet! I think heat-holder tights would be pretty awesome, especially as a layering item! Heat holder thermal leggings. I can usually keep everything else warm on those frigid days but my legs take the brunt of the cold. I recently saw an all in one show breech and show shirt combo. It was basically a unitard. How nice would an all in one winter breech and turtleneck be? Maybe with built in gloves and socks!! The stripes are so cute! My idea for a new prodcut would be a scarf. I love infinity scarves! How about a hat, a neck warmer, and, of course, gloves. Even a vest to wear under dressier clothes might be a good idea. I wear headbands instead of hats; a Heat-Holder one would be wonderful for those really cold, windy days! My feet are always cold, maybe socks with a built in pocket for those little disposable hot-packs. Heat holder tights would be awesome. Yes - I second this :) Tights to fit under breeches, please! 2 things, a riding vest to keep the core warm, and a helmet cover with long flaps in back to cover the neck, add a bit of velcro so it can be hooked around the front and cover the throat too. Make is bright colors for hunting season! Today is my birthday, I would LOVE to win these!! :) I wear socks every day and night because my feet are always cold! I think that heat holder gloves would be perfect for this weather! This is exactly what I've been looking for! So much cheaper and easier than finding winter boots for my hard-to-fit feet. Gloves would be marvelous, and even a scarf or hat, but my official vote is for baby socks and mittens. My little daughter doesn't have the best circulation due to a heart condition, and her chilly hands and feet just break my heart! I second the sleeve holders with the thumb holes! My fingers get seriously cold so mitten or glove liners would be perfect. What I wouldn't give for HeatHolder gloves for all those long cold winter mornings at the barn! Thermal underwear with HeatHolder would rock my world!! My ears are always cold, so ear covers would be great! I own a few pairs of these socks, and I can honestly say that they are amazing. I wear a pair pretty much every day, as I spend a lot of time walking around campus & up here our temperature WITHOUT windchill likes to sit at a high of around -5 to -10. What I'd really like to see are heat holder onesies! I'd snap one of those babies up in a heartbeat. I would suggest a heatholder sock which actually works. They're rubbish. Wrist/ankle supports. I think they would be fab for arthritis sufferers. A SOCK FOR MY NOSE. IT ALWAYS GETS THE COLDEST! PJ's would be amazing! Some that you could really snuggle up in. A heat holder hat for me or my horse! Dressing gown, a down to the ankles one so that the only exposed bit would be feet and since they'd have heatholders socks on they'd be cosy! Sigh! Lovely! I'd love a Heat Holders snood - you could pull it down over your shoulders into a shrug if you felt really chilly. Something to keep my nose warm, it always gets cold, hehe! heat holder gloves to keep my hands warm. Heat holder gloves would be good. A onesie! I feel toastie just thinking about it. Thermal nose muff! My nose tip always gets the coldest! Heat holder hats with earmuffs would be ace - that's where I feel the cold most! something to keep your ears warm. a headband with warmers in maybe? Welly Liners to wear coupled with heat holder socks! For some reason, wellies are ALWAYS cold! i would love some shorts to keep my bum and top legs warm!